That's the plan, but I'd like a few more to make it worth it for people. Did the organ guns ever get released? I thought they were a super rare thing that people only had a couple of in their collections. Never released, they're common in New England though. People don't have a bunch of Dwarf organ guns already? Huh, must be a New England thing. We have Dwarf organs flying every which way up here. Got my first WiP shot from Bob. I've asked him to reduce the size of the wheels and the length of the limber. New WiP shot. I mentioned to Bob that the crewmen look small already. Mmm... A little bit small, maybe... But well, they look great, anyway ! I like the aspect of the beard of the fourth from left. It gives him a very realistic look. And the general aspect of the fifth one. Some more WiP shots. And a few notes. 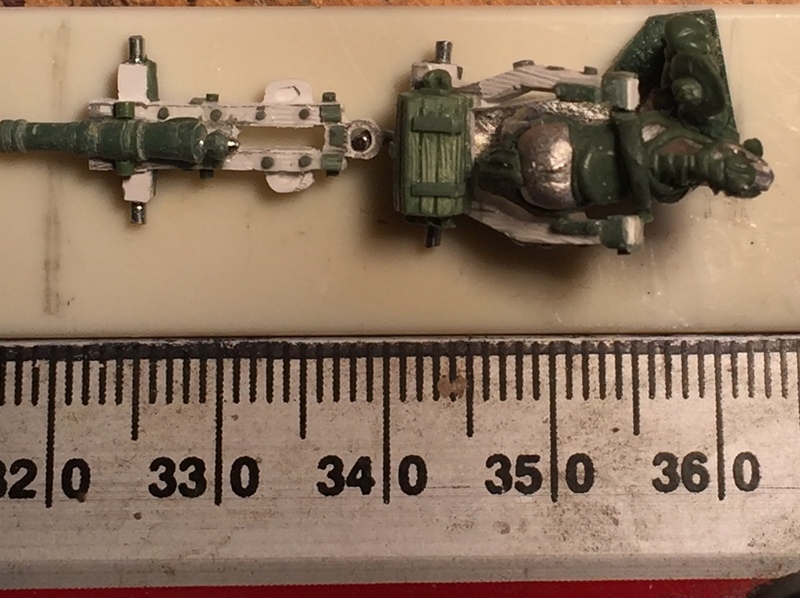 Each pack will have two cannons, one in the limbered position (it will just fit on a 20x40mm base) and another in the firing position. You'll have three wheel options (solid, spoked, reinforced spoked) for the cannon and the carraiges, and six crew. Three of the crew I'll likely reuse in another artillery pack. On the figure height, I believe Bob overshot the mark. I've asked for another picture but I'm really trying to get him to get them to 10mm at the eye. The boots needs some work as well, and the solid wheel needs to be made round. The cannon look rather modern looking to me. Perhaps a bit of a simpler barrel, less taper, less bands? The crew in the more recent pictures look very good. Oh wow! It's all looking very promising. Glad that you're offering spare wheels and stuff as I love using those for scenic bits. Amazingly, I've never found a decent "treasure chest" at 10mm, or storage chest as you have there. Would love to have some to dot around or have as treasure pile objectives . I agree with my esteemed colleagues light artillery first , id be interested in 4 packs assuming one gun per pack . Next unit for me would be flying guys with crossbow . Again limited numbers . Or how about Marauder infantry , but do them more in the style of your existing infantry ? Characters would be great . Nearly there. Last change is reducing the size of two of the crewman's boots. Any other thoughts before they're sent to me?